Precise estimates of progression rates from ‘prediabetes’ to type 2 diabetes are needed to optimise prevention strategies for high-risk individuals. There is acceptance of prediabetes defined by impaired fasting glucose (IFG) and impaired glucose tolerance (IGT), but there is some controversy surrounding HbA1c-defined prediabetes ranges, with some favouring 6.0–6.4% (42–46 mmol/mol). Comparing progression rates between groups might aid this issue, thus we aimed to accurately estimate progression rates to diabetes from different prediabetes categories. Meta-analysis of prospective observational studies in which participants had prediabetes at baseline (ADA-defined IFG [5.6–6.9 mmol/l], WHO-defined IFG [6.1–6.9 mmol/l], IGT (7.8–11.0 mmol/l) or raised HbA1c [6.0–6.4%/42–46 mmol/mol]) and were followed up for incident diabetes. Incidence rates were combined using Bayesian random effects models. Overall, 70 studies met the inclusion criteria. In the six studies that used raised HbA1c, the pooled incidence rate (95% credible interval) of diabetes was 35.6 (15.1, 83.0) per 1,000 person-years. This rate was most similar to that for ADA-defined IFG (11 studies; 35.5 [26.6, 48.0]) and was non-significantly lower than WHO-defined IFG (34 studies; 47.4 [37.4, 59.8]), IGT (46 studies, 45.5 [37.8, 54.5]) and IFG plus IGT (15 studies, 70.4 [53.8, 89.7]). Similar results were seen when the data were analysed by the criteria used to diagnose diabetes. This study provides evidence that progression rates differ by prediabetes definition, which has implications for the planning and implementation of diabetes prevention programmes. HbA1c 6.0–6.4% might identify people at a lower diabetes risk than other prediabetes definitions, but further research is needed. The online version of this article (doi: 10.1007/s00125-013-2902-4) contains peer-reviewed but unedited supplementary material, which is available to authorised users. Type 2 diabetes has adverse outcomes including early mortality , and is traditionally defined by the WHO on the basis of OGTTs as fasting blood glucose (FBG) ≥7.0 mmol/l or 2 h glucose ≥11.1 mmol/l (glucose measured 2 h after consumption of a standard 75 g glucose dose) . Blood glucose is, however, continuous, and evidence suggests that people with high, but not within diabetes range, glucose levels still risk developing diabetes complications and have a high risk of developing overt diabetes. Therefore, this condition is often referred to as ‘prediabetes’. Controversy surrounds this terminology and the use of hyperglycaemia cut-off points, but identifying high-risk groups is useful for planning and implementing diabetes prevention programmes. Different prediabetes definitions exist, mostly based on FBG (impaired fasting glucose, IFG) or 2 h glucose (impaired glucose tolerance, IGT). The WHO 1999 criteria define prediabetes as FBG of 6.1–6.9 mmol/l (IFGWHO) and/or 2 h glucose of 7.8–11.0 mmol/l . The ADA 2003 criteria define prediabetes as FBG of 5.6–6.9 mmol/l (IFGADA) . There is recent interest in prediabetes defined using HbA1c. In 2011, the WHO added HbA1c ≥6.5% (48 mmol/mol) to their diabetes definition, but concluded that there was insufficient evidence regarding an HbA1c prediabetes range . Conversely, the ADA have added HbA1c of 5.7–6.4% (39–46 mmol/mol) to their prediabetes definition , while the International Expert Committee  and the UK-based National Institute for Health and Clinical Excellence  support using 6.0–6.4% (42–46 mmol/mol). We conducted a meta-analysis of progression rates from different prediabetes definitions to diabetes in observational studies. Our aim was to provide accurate estimates of progression rates focusing on whether HbA1c of 6.0–6.4% (HbA1c6.0–6.4%) had a similar progression rate to other accepted definitions to address the gap in knowledge regarding this definition. We searched Ovid Medline (from 1993 to 10 February 2012) and Embase (from 1993 to Week 5 2012) using a search strategy constructed with a clinical librarian (electronic supplementary material [ESM] Methods). It used Medical Subject Headings and free text terms covering ‘prediabetes’, ‘type 2 diabetes’ and ‘progression’, and was restricted to articles written in English and pertaining to humans. Reference lists of relevant systematic reviews and articles were hand searched. We then removed duplicate publications and reviewed the articles to identify studies that met the following inclusion criteria: (1) observational prospective study; (2) at least a subset of the participants had IFGADA, IFGWHO, IGT, IFG+IGT or HbA1c6.0–6.4% at baseline; (3) the prediabetes group was followed up; (4) incident diabetes was reported; and (5) all subjects were aged ≥18 years at baseline. Studies were excluded if participants received bariatric surgery or any lifestyle or pharmacological intervention likely to affect progression rates. Where a study was reported in multiple publications, the publication with the highest total person-years was included. Authors were contacted to obtain missing data. The main outcome was the pooled incident rate (IR) of type 2 diabetes per 1,000 person-years for each prediabetes definition. Data are presented as pooled IR (95% credible interval [CrI]) where a CrI is the Bayesian equivalent of a confidence interval. The IRs were estimated using Bayesian random effects meta-analysis with vague priors in WinBUGS v1.4.3, assuming that the incident cases had a Poisson distribution and the log IR was normally distributed. Models were fitted for all studies and separately by diabetes diagnostic criteria. Heterogeneity was estimated using the between-study variance (τ2). Sources of heterogeneity were explored using univariate meta-regression, with study-level covariates as the explanatory variables. As an example, the WinBUGS code to fit one of the models is in ESM Methods. The remaining WinBUGS code is analogous and available from the authors upon request. The literature search identified 70 eligible studies (ESM Fig. 1), the characteristics of which are in ESM Table 1. Pooled IRs of diabetes per 1,000 person-years are given in Table 1. When any diabetes definition was allowed, the IR was lowest for IFGADA followed by IGT, IFGWHO and IFG+IGT. However, scrutiny of the CrIs shows that only IFG+IGT had a significantly higher IR than the other categories, and IFGADA, IFGWHO and IGT were not significantly different from each other. These results were fairly consistent regardless of diabetes definition. The IR for HbA1c6.0–6.4% was most similar to the IFGADA rate, although not significantly different from any of the other rates, when any diabetes definition was allowed and when the diabetes criteria included HbA1c. When the diabetes criteria included FBG, the HbA1c6.0–6.4% rate based on two studies was most similar to IFGWHO. No studies that included HbA1c6.0–6.4% used 2 h glucose to diagnose diabetes. Heterogeneity (τ2) ranged from 0.18 to 1.10, with most of the prediabetes subgroups showing low to moderate heterogeneity (Table 1). The IRs were unadjusted, and therefore the effect of well-established diabetes risk factors on the IRs was investigated through meta-regression (Table 2). The IR ratios were not significant, except that, in the IFGWHO group, mean BMI was inversely associated with progression, and there was a lower progression rate in Europe than in Asia in the IFGWHO groups (Asia: IR 60.6 [48.0, 76.2]; Europe: IR 33.0 [15.7, 66.3]) and IFG+IGT (Asia: IR 100.8 [77.9, 126.8]; Europe: IR 53.2 [25.4, 102.8]). Accurately describing progression rates to type 2 diabetes is clinically important for accurately identifying people at particularly high risk and for effectively planning interventions and monitoring of these people. Thus, we used a meta-analysis to pool existing estimates of progression rates within different prediabetes definitions. The groups identified by IFG and IGT have relatively little overlap, leading to suggestions that fasting and post-challenge hyperglycaemia are driven by different biological mechanisms . It is suggested that IGT is the result of excessive endogenous glucose production (insulin action defect) in combination with beta cell dysfunction (insulin secretion defect). Conversely, after food ingestion, this mainly hepatic glucose output is appropriately suppressed in individuals with isolated IFG, suggesting that an insulin secretory defect is mainly responsible for resultant plasma hyperglycaemia in this condition. 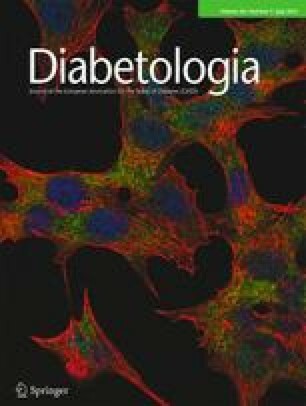 Our findings regarding IRs in IFG and IGT groups are consistent with a systematic review conducted in 2007 , with the ADA’s finding that their IFG definition had a lower specificity but a higher sensitivity than the WHO’s , and with the knowledge that having IFG+IGT is typically associated with later phases of glucose intolerance . Since HbA1c was added to the diabetes criteria , there has been interest in prediabetes defined using HbA1c, but current guidelines conflict about which definition to use, primarily because of insufficient data [5, 6, 7]. Some expert committees favour the range 6.0–6.4% [6, 7]. In that group, we estimated that 36 new diagnoses of diabetes would be expected per 1,000 person-years. Although the wide CrIs make interpretation difficult, it appears that this measure relates most closely to the IFGADA category. Our data suggest HbA1c6.0–6.4% is associated with a slightly lower diabetes risk than IFGWHO and IGT and reinforces the need for further research establishing the predictive capacity of HbA1c6.0–6.4%. Within some subgroups, there was high heterogeneity, which we explored using study-level covariates. Few covariates were significant, suggesting that the heterogeneity was either due to covariates that were not considered or chance. The way in which diabetes was defined appeared to play a role because on the whole heterogeneity was reduced when analyses were stratified by diabetes criteria. Glucose and HbA1c appear to detect different diabetes populations . The way in which prediabetes and diabetes were defined were closely related, which resulted in very small numbers of studies in some subgroups, making comparisons difficult. However, progression rates were similar when fasting glucose or 2 h glucose was included. Too few studies used HbA1c as a diabetes criterion to make useful conclusions, suggesting that this is an area where future research is required, particularly when it is considered that HbA1c is now commonly being used to diagnose diabetes in clinical practice. Our conclusions have limitations. The analysis was confined to existing prediabetes categories, did not include progression to diabetes from normoglycaemia or regression to normoglycaemia from prediabetes, and heterogeneity probably contributed to some overlap of CrIs, thereby influencing outcome comparisons. Furthermore, the diabetes definition in some studies was not restricted to biochemical confirmation, but could utilise physician diagnosis or medication initiation as diabetes end points. The validity of directly comparing populations whose primary outcome is defined by different criteria is justified here because the aim of the study was to report cumulative progression rates using established and internationally accepted criteria. While acknowledging the inherent difficulties associated with combining population-level observational datasets in meta-analyses of this kind, we feel this study has major strengths. To our knowledge, this is the largest predictive meta-analysis of IFG, IGT and raised HbA1c categories. Moreover, rigorous methodology ensured literature searches and statistical analyses met accepted standards for meta-analyses. We provided pooled estimates of progression rates from prediabetes to diabetes that suggest that rates were lowest for IFG, slightly higher for IGT, and highest for IFG+IGT. HbA1c6.0–6.4% had a similar diabetes risk to IFGADA. Further investigation is justified since non-significance meant that our results were not conclusive. These findings suggest that different management strategies might be required in future prevention programmes. The authors would like to thank Sarah Sutton (University Hospitals of Leicester Libraries, UK) for her valuable input into designing the literature search, Tom Leigh (Leicester Diabetes Centre, University Hospitals of Leicester) for his help with performing the literature review, Beverley Balkau, Richard Legro, Inna Misnikova and Soraya Soulimane for providing data that were not available in the original study reports, and the following authors for providing data for an earlier version of this manuscript: Simona Bo, Hertzel Gerstein, Rury Holman on behalf of the NAVIGATOR Executive Committee, Yonghong Huan, Allen Kunselman, Pia Pajunen and Markku Peltonen. This work was supported by funding from the Department of Health, the University Hospitals of Leicester Diabetes Research Fund and Diabetes UK, and was conducted as part of activities supported by the National Institute for Health Research Collaboration for Leadership in Applied Health Research and Care–Leicestershire, Northamptonshire and Rutland (NIHR CLAHRC–LNR) and The NIHR Leicester–Loughborough Diet, Lifestyle and Physical Activity Biomedical Research Unit, which is a partnership between University Hospitals of Leicester NHS Trust, Loughborough University and the University of Leicester. The study funders had no role in the collection, management, analysis or interpretation of the data, or in the preparation, review, or approval of the manuscript. K. Khunti and M.J. Davies are members of the National Institute for Health and Clinical Excellence (NICE) committee and are also part of the Department of Health group recommending HbA1c for the identification of high-risk people. All other authors declare that there is no duality of interest associated with their contribution to this manuscript. KK, MJD and BS conceived the study. DHM, FA and BS designed the literature search. DHM, FA, DW and LJG conducted the literature search. DHM and FA extracted the data. DHM performed the data analysis with contributions from LG and FA. DHM and DW wrote the first draft and all authors were involved in the data interpretation, writing and revising the manuscript and approved the final version. DHM had full access to all the data in the study and takes responsibility for the integrity of the data and the accuracy of the data analysis.